Physical fitness is becoming a part of many preschool curriculums and state early learning standards. Some of the findings show that simply having pathways for children to walk on keeps them moving and increases fitness levels. To help create pathways that keep children moving, the outdoor play area can simply have stepping stones going from one learning center to the next. 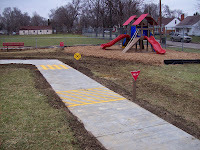 There are other types of activities that can also be used as connectors such as multi-level balance beams, stepping pods, or a simple chalk line to walk on. Programming our children into sports or simply providing 30 minutes of physical fitness exercise has not worked in improving our children’s health. The main difference between children today and children in the past is that children in the past moved continuously: walking from one friend’s house to another, playing in the neighborhood, etc. They were not necessarily running and jumping, just moving all day long. So creating outdoor environments that keep them moving is the best thing we can do for their health.